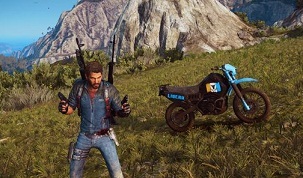 Among the many vehicles, there are a total of eleven motorcycles can be found in Just Cause 3. You can use the off-road vehicles such as Geschwind V3000 and Autostraad Kletterer 300 to avoid the streets and to explore Medici and liberate settlements. 1. 69 Stria Sussurro - In every respect an average vehicle with minimal armor. 2. Mugello Furia MS-316 - A pretty agile and fast motorcycle with low armor. 3. MV402 - The fastest bike that you can find in Just Cause 3. It is also quite agile, but only lightly armored. 4. Stria Risata - With a top speed of 120 km / h takes you to your destination faster. 5. Stria Giovanni - A pretty agile and fast motorcycle with low armor. 6. Vintage Stria M7 - A manoeuvrable machine with classic design and low armor. 7. Pavouk U-15 - One of the three most manoeuvrable vehicles with mediocre speed. 9. Autostraad Kletterer 300 - This all-terrain vehicle is quite agile, but only mediocre fast. 10. Custom Kletterer 300 - This is the most agile quad in Just Cause 3, with average fast. To unlock it you must complete all 10 Stunt Jumps in Insula Dracon. 11. Incendiario Monster Truck - This vehicle is best armor in its class and rightward. However, you have to unlock it by completing all 7 Stunt Jumps in Insula Striate.